Casey's 21st birthday is something that she had been looking forward to for a long time. 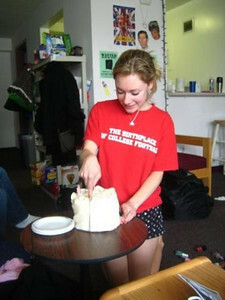 For every roommate's birthday, us Fordham girls try our best to plan something special and memorable. These are the pictures from the few days leading up to the final celebration and her big day! "my dreammm BIRTHDAY CAKE FROM MAGNOLIA ♥ thank you callie"
Callie all the way from Boston made sure to get Casey the type of cake that she had always wanted: a Magnolia vanilla/vanilla cake, pink frosting, with sugar flowers. Magnolia cupcakes were always Casey's favorite!